This article is a translation-work in progress of the article Mapa Mundi de Beato de Liébana from Spanish to English. The image shows a copy of the Beatus Map from the Saint-Sever Beatus, produced in Saint-Sever Abbey, France. The map is faced eastwards, and not northwards, as usual in modern cartography. For this reason it is said that the map is oriented. The Beatus Map or Beatine Map is one of the most significant cartographic works of the European Early Middle Ages: It was originally drawn by the Spanish monk Beatus of Liébana, based on the accounts given by Saint Isidore of Seville, Ptolemy and the Holy Bible. Although the original manuscript is lost, there remain several copies extant, which retain a high fidelity with respect the original. The Map is shown in the prologue of the second book of Beatus' work Commentary on the Apocalypse. Its main goal is not to depict a cartographically exact depiction of the world and its continents, but to illustrate the primitive Diaspora of the Apostles. According to the descriptions of the Book of Genesis (which was one of the main sources of Beatus), the Earth was thought to be plane and to sustain the vault of heaven, where the Sun, the Moon, and many other minor luminaries like planets and stars, moved. There were two sorts of water masses: The waters above the firmament, which were contained by the vault of heaven and occasionally fell to Earth in form of rain, when the floodgates opened, and the waters below, which nurtured the rivers, the streams and the great salt water masses. 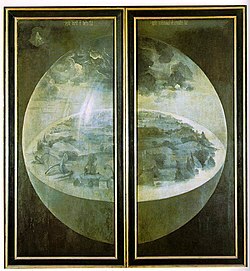 This image of The Garden of Earthly Delights illustrates the Hebrew Weltanschauung which is reflected in the book of Genesis. The Earth is a disc surrounded by two water masses: the upper waters, which occasionally fall to earth in form of rain when YHVH opens the floodgates of Heaven, and the lower waters, formed by the seas, the lakes and the Ocean. In the depths of the Cosmic Sphere lay the sheol, dwelling of the dead until the Judgement Day. In this mappamundi, the world is represented as a circular disc surrounded by the Ocean. The Earth is divided in three continents: Asia (upper semicircle), Africa (right lower quadrant) and Europe (left lower quadrant), which belonged respectively to the descendants of the three sons of Noah: Shem, Ham and Japheth. The continental masses are separated by water streams and inner seas like the Mediterranean (Europe-Africa), the Nile River (Africa-Asia) and the Bosporus and the Aegeus Sea (Europe-Asia). In the center of the world lays Jerusalem, sacred city to Christianity and Judaism alike, where Abraham was about to sacrifice his own son, Isaac, and where the happenings of the Passion and Resurrection of Jesus did take place. The conception of Jerusalem as an ombilicum mundi was quite usual in the medieval Christian spirituality: In the Divine Comedy, Dante starts his travel to hell from the soils of this city. In this illustration from the calendar page of the book The Very Rich Hours of the Duke of Berry is shown the expulsion of Adam and Eva from the earthly Paradise. During all the Middle Ages it was believed that the Garden of Eden was located at the eastern end of the world, and that it was possible, in theory, to reach that place. Columbus attempted it. At the eastern end of Asia is found the Garden of Eden, a paradisical territory where it is never cold or hot, and where trees and wood of all kinds grow. In its center stands the Tree of Life, and next to it there is a fountain from which the four rivers of Paradise: Tigris, Euphrates, Pishon and Gihon flow. The entrance to Paradise is protected by a Cherub who brandishes a sword of fire. On the southern coast of the Asian continent is found India, an enormous territory traversed by three rivers, the Indus, Ganges and Hipane. It is abundant in men of dark color, elephants, rhinoceroses, spices and precious stones such as rubies, emeralds or diamonds. Its fields are blessed by the west wind, Favonio, and for that reason they yield two harvests a year. In that location are found the Mountains of Gold, access to which is forbidden to humans by griffins and dragons. Off the Indian coast are the islands of Taprobane (Sri Lanka, formerly Ceylon), abundant with gems and elephants, Chrysa and Argyre, rich in gold and silver respectively, and finally Tyle, whose trees never lose their leaves (it has been speculated that this is some island of Indonesia). To the west of India one finds Parthia, a region that extends between the rivers Indus and Tigris. It is divided into five different provinces: Aracusia; Parthia proper, called thus by the Parthians, brave soldiers from Scythia who founded an empire that dealt with Rome on an equal basis; Assyria, called thus by Asshur, the son of Shem, famous for its purple dyes and all types of perfumes and ointments, in it situated Níniveh, the capital of the old empire of the Assyrians, and where Jonas the prophet went to preach futilely; Medes (northwest Iran), which is divided in two parts, Greater Medes (Hamadan, Kermanshahan, Qazvin, Tehran and Espahan) and Smaller Medes (Azarbaijan); and finally Persia, birthplace of King Cyrus, the anointed one of God, and the region where magical science arose for the first time, introduced by Nebroth the giant, after the confusion of languages had emerged in Babel. Abrahamic tradition makes Ur of Caldea the mother country of the patriarch Abraham. The early Spanish Albeldense and Rotense Chronicles, when they recount the Islamic invasion of Spain, make a subtle ethnic distinction between the invaders: Berbers (such as Tarik) are given the name of Moors, while the Arabs (the ethnic group of Musa ibn Nusayr) are called Chaldeans. And in those times it was considered that Chaldea and not Arabia was the original country of the Saracens. Mesopotamia is the region located between the rivers Tigris and Euphrates. There we find the regions of Babylon and Chaldea. Babylon was the ancient conqueror of the kingdom of Judah and the place where the Jewish people were exiled. In that city the revelations of the prophet Ezekiel took place, which had so much influence on the creation of the Prophetic Chronicle. From Chaldea (South of Mesopotamia), the Asturian Chronicles supposed, came the hordes that invaded Spain and were defeated by Pelayo in Covadonga. Among the most important cities of this region can be mentioned Ur, the birthplace of the patriarch Abraham, as well as Erech (or Uruk), which was founded by Enoch. To the south of the Euphrates river and sinus Persicum (Persian Gulf), Arabia was located, a desert region whose southern part (present-day Yemen) received the name of Arabia Felix, Happy Arabia. It was a rich, fertile land where precious stones, myrrh and incense abounded. In it lived the fabulous bird phoenix, which after dying surrounded by fire was reborn of its ashes. On the northeast border of Arabia, already in territories of the old Roman Empire, extended the province of Syria, whose limits were the Caucasus and Taurus Mountains to the north, the Euphrates to the east, the Mediterranean Sea and Egypt to the west, and Arabia to the south. Syria had three different provinces: Comagena, Phoenicia, and Palestine. The territory of Phoenicia extended from the Mediterranean Sea to Mount Lebanon and the sea of Tiberiades. In Phoenicia were found the famous cities of Sidon and Tyre. In the latter they preached so much that the prophet Elias was Jesus Christ. Further south was located Palestine, which was subdivided into four different provinces: Galilee, where they nailed Jesus of Nazareth, the sea of Tiberiades, where a good part of the apostles worked as fishermen, and Monte Tabor, the place where the Transfiguration occurred. Africa is obviously from the Nile river with a lake as its source. The Maghreb is named "Libia" and Africa is surrounded by a sea coloured red. This page was last edited on 14 February 2019, at 13:29 (UTC).